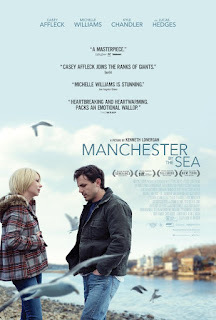 Writer, Actor, Director Kenneth Lonergan (You Can Count on Me, Gangs of New York) brings us this ordinary tale of ordinary folk getting by, in the north of America. Nothing special there, but it's presented beautifully and offers us an excellent alternative to the usual crash, bang, wallop! Our 30-something central character, Lee, lives a solitary life, getting by as a janitor in Boston, keeping himself to himself, but also kicking against the pricks and not taking what the establishment decides to dole out to him. He often gets into trouble because of attitude and all this points to something in his past that has made him depressed, as he engages with the futility of existence. Think Good Will Hunting. One ordinary day, he's contacted by the folk in his hometown, Manchester (the one in America), to attend to his brother who appears to be on death's door. Before he gets there, his brother has died and has also left a will which lumbers Lee with the guardianship of his son. The son is a 16-year-old who's similarly-minded to Lee, remembering uncle Lee from his childhood, snatching what he can from life aggressively and engulfing whatever experiences he can grab. The story then becomes a character study of Lee and an observational tool as the new responsibilities are either embraced or rejected by him. As the tale unfolds, we get to understand what the past was about and why he doesn't live in the town any longer. There is use of flashback, but not intrusively so and it's obvious when it's happening. No confusion from leaping around timelines willy-nilly. Audience empathy with his situation is encouraged by Lonergan by making sure that we stay with Lee most of the time and see his world from as close to inside his head as we can get. It's a story of challenges for a simple soul who was trying to live a simple life with wife and kids, struck down by tragedy. It's often sad as we get inside the lives of those who have been subjected to the events. There's one short scene between Lee and his wife which, through harrowing emotion, demonstrates the quality and power of the acting - but never sinks into sentimentality. I think it's a shame that the relationship between the two was not written into the film more as that would have been as interesting as the central duo. Lee is played by Casey Affleck (The Assassination of Jesse James, Gone, Baby Gone) and he does it to near perfection. He's convincing in every scene of the film and is able to bring across to the audience the emotions, plight and dilemma facing his character. The nephew is played annoyingly admirably by Lucas Hedges (Moonrise Kingdom, Lady Bird, Three Billboards Outside Ebbing, Missouri) and Lee's wife by Michelle Williams (Brokeback Mountain, Blue Valentine, My Week with Marilyn) who plays, as I said, a smaller, but noteworthy role. The main two leads are most enjoyable to watch and execute their talents with class. As they play off against each other, grappling for position, advantage, seeking truth, dealing with guilt, pain and desire. You can see that there's a chemistry between them and have both been chosen well. There's some great camerawork on show here, especially in the scenes in which they head out onto the water in a boat, but also evident in ordinary scenes, interiors and round about the town. The music is sympathetic to the story, fits in nicely and the sets are mostly on location, which is atmospheric with much snow, rain and dour weather. This reflects the whole outing really - yes, a bit of a slow-burner with nods to european cinema - but this is real life. It turns out that it's a bit of a Marmite moment for many however, either love it or hate it, the film industry seemed to love it but many viewers just don't get it. That's sad for them as they are missing out on much.